Snake-bite kit: check. Sub-zero dry suit: check. Air horn: check. If it sounds like I am getting ready for basic training, you're close. I am heading off on my very first "mancation". Have you heard about these things? Apparently it is one of the fastest growing sectors in the vacation industry, and seeing as I am "in the biz," I figure I am obligated to check it out. Now I know what you are thinking: a week of drinking, cigar smoking, gambling, and carousing, disguised as a vacation. Sort of like "The Hangover" meets "Bachelor Party". And while that segment of the travel industry is as healthy as ever, this new phenomenon involves men traveling together, encouraging one another to try extreme sports, physical challenges, and anything involving firearms. And while I have never been much of a "shoot and eat it" type of guy, I'm not the "quiche and needlepoint" type either. So in the spirit of self-exploration and Gonzo journalism, I've put together a crew of my old college buddies, and we're hitting the road. We've decided on Park City, UT, as our base. There are at least ten different ways you can break your neck within a 50 mile radius, and there are also great timeshare rentals to be had. I know, I know, we're supposed to be roughing it. And we will be when it comes to our daytime exploits. But I need my beauty rest, and since all members of my posse are old enough to remember the Nixon administration, a couple of extra bedrooms and bathrooms are in order. We've decided on a 2-bedroom/2-bathroom rental at Marriott's MountainSide at Park City. It puts us in close proximity to everything, and sleeps eight. First up on our docket of events is, of course. skiing. But not just any skiing. We'll be heading out with the Park City Powder Cats to 40,000 acres of privately owned land in the Uinta Mountains called The Thousand Peaks Ranch. Outside of Alaska, the Uintas are the largest east/west mountains in the U.S. with nearly a dozen peaks exceeding 13,000 feet. They offer steep downhills, secluded bowls, and some of the best tree skiing anywhere. And check out some of these trail names: "Warren Miller Chutes", "Giant Steps", and "The Dark Side". I am so dead. But that is what mancations are all about. You push yourself to your limits, and when you're ready to chicken out, you know one of your buddies has your back. Although frankly, I haven't seen some of these guys in like thirty years, and they are looking pretty soft themselves. We'll see. Nightfall will find us at the High West Distillery & Saloon, Utah's first distillery since Prohibition, and the only ski-in distillery anywhere. I am not sure how the ski-out part works, but I guess we'll find out. Next up it is Utah Olympic Park, home of the 2002 Winter Olympics and a training site of the U.S. Olympic Team. 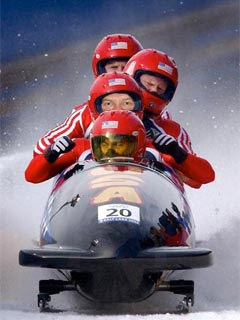 On our list of events is a run down the Comet bobsled course. That's right, three passengers and a professional driver are propelled down the very same course used to crown the Olympic champion, reaching speeds of 80 mph and pulling 5 Gs in the turns. Check this warning from their website: "We strongly discourage anyone with chronic neck problems, back or kidney problems, heart problems, recent surgery, and/or high blood pressure." Are you kidding me?! That pretty much describes my whole crew. And just in case you are a complete idiot, they add this disclaimer: "furthermore, pregnant women need not even inquire about the Comet bobsled, as they will not be allowed to ride under any circumstances." It should also go without saying that pregnant women are disqualified from mancations as well. "Certain risks cannot be eliminated without destroying the unique character of this activity. These same elements may, in rare instances, cause permanent trauma or death. We do not want to frighten you or reduce your enthusiasm for this activity, but we do think it is important for you to be informed of the inherent risks." And then they go on to list - in extraordinary detail - each of those risks. Now if that is not intended to frighten or reduce enthusiasm, the $1,000/person ought to do it. Oh well, I guess what doesn't kill me (or put me in the poor house), makes me stronger, right? The last thing we need to do is agree on a name for our gang. Right now we are going with "The Silver Foxes" which I really hate. It makes us sound like a bunch of old geezers out on the prowl. I suggested the "Bucket Gang" but was shot down. You know, like that movie where the guys know they are going to die, so they set out to accomplish all of their life-long adventures before they "kick the bucket"? Hmmm. I guess I can see where that wouldn't go over with everyone. But it is a long flight, and I am sure I can flip at least one vote in my direction simply by offering up my Hammacher Schlemmer Neck-Kink Preventing Travel Pillow. I'm telling you, these guys are really old and the slightest twist or sprain could put the kibosh on the whole thing.